Macro Musings Blog: Are We Mismeasuring Productivity Growth? I am in Washington, D.C. for the Future of U.S. Economic Growth conference at the CATO Institute. Brink Lindsey, the conference organizer, has put together a great group of speakers who will cover everything from secular stagnation to the singularity to the decline in economy dynamism. What makes this conference really interesting is that it has thoughtful participants on both sides of key issues. For example, there is an panel that has both Erik Brynjolfsson and Robert Gordon on it. That should be fun to watch! I confess to coming in with strong priors on some of these issues--see my National Review article with Ramesh Ponnuru on secular stagnation--but look forward to being challenged and informed by the presenters. [T]echnology growth appears to be rapidly growing but getting harder to measure. This point has been made recently by Joel Mokyr in the Wall Street Journal and Erik Brynjfolsson and Andrea McAfee in The Second Machine Age: Work, Progress, and Prosperity in a Time of Brilliant Technologies. Their basic point is that the economy is being radically transformed via smart machines and this will spur a period of great productivity growth, high returns to capital, and more investment. For example, imagine all the new infrastructure spending that will have to be done to support the increased use of driverless cars and trucks. Even over the past few decades there have been meaningful gains as illustrated by this hilarious spoof the show 24 being made in 1994. 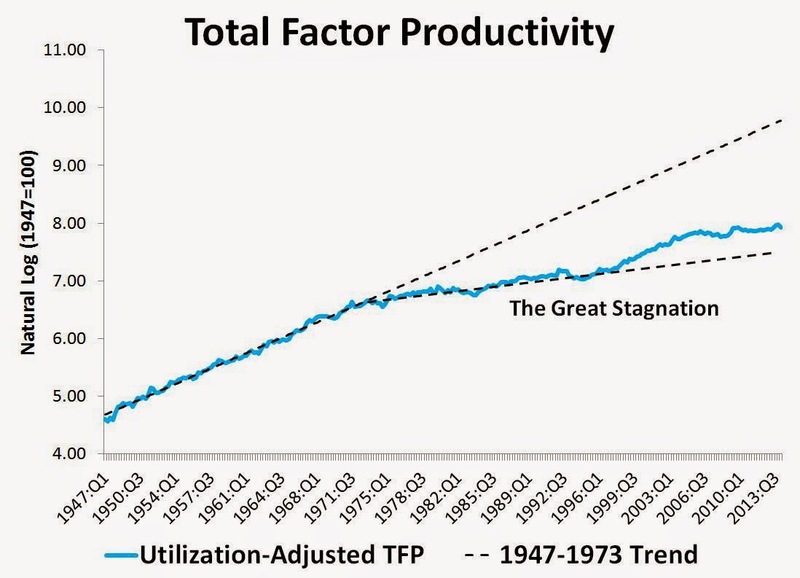 Noah Smith makes the case for big productivity gain even more recently. The secular stagnationists should take these developments more seriously. Probably one reason these developments get overlooked is that they are hard to measure. As I noted in my Washington Post piece, a good example can be found in your smartphone. It contains many items you had to formerly purchase separately--books, newspapers, cameras, scanners, bank ATMs, voice recorders, radios, encyclopedias, GPS systems, maps, dictionaries, etc.--and were counted part of GDP. Now most are free and not a part of GDP. My sense is this is not a recent phenomenon, but has been going on for sometime as the economy has become more service orientated. Measuring productivity in the service sector is notoriously hard. And it is only going to get harder. 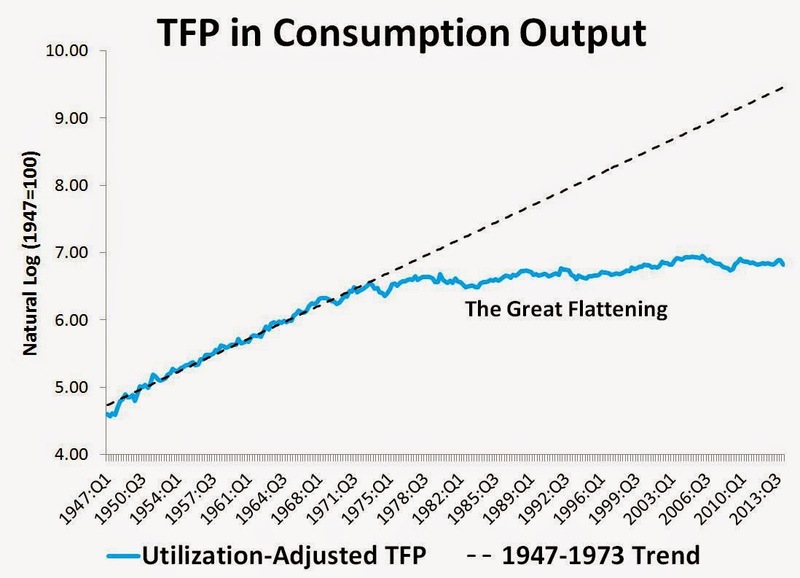 While that is interesting, what is really striking is the TFP in consumption. It has basically flatlined since the early 1970s and is what is driving the Great Stagnation. In the spirit of Tyler Cowen, let's call this segment "The Great Flattening." The Great Flattening does not seem reasonable. 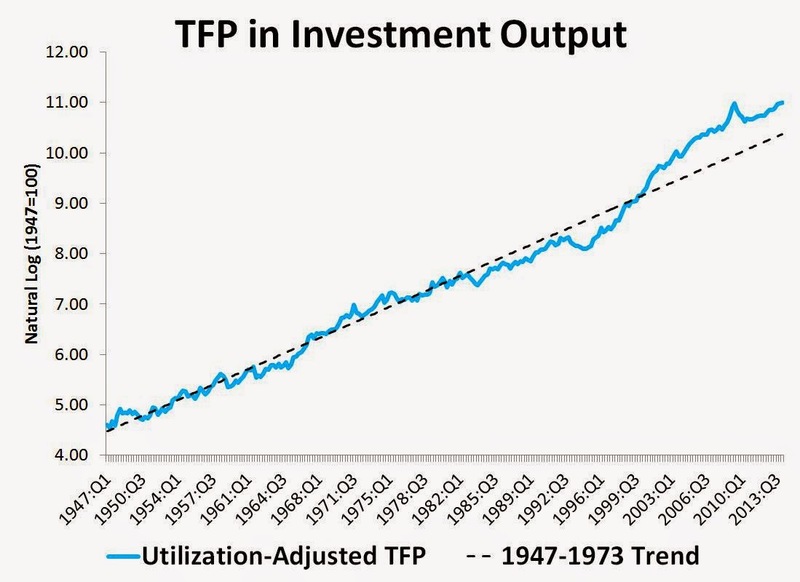 Has productivity growth in consumption really been flat since the early 1970s? No meaningful gains at all? This does not pass the smell test, yet this is one of the best TFP measures. This suggest there are big measurement problems in consumption production. And I suspect they can be traced to the service sector. I suspect if these measurement problems were fixed there would be less support for secular stagnation (and maybe for the Great Stagnation view too). If we want to have the right debate, we have to have right measures. My recollection is that median wages started to fall below productivity increases at almost the same time. Of course this could also be a measurement issue, though I think that is less likely. How do we find out what is going on here? That is great that economics grow but unfortunately the economy is still in difficult situation. Many people have to take financial help because hey are in difficult financial situation. You can try to use installment loan if you need financial help. The sums are not big. Many people have to take them because the government doesn’t help. Hope that the situation will change and people will get financial help.